3. Speaking of tough dudes, Rex Burkhead was in Lincoln last week for the annual Team Jack Foundation Gala, which gave me an occasion to reminisce with Ron Brown about Burkhead's career at Nebraska (2009-12). I had forgotten Burkhead gunned five touchdown passes as a wildcat quarterback. I had forgotten how well Burkhead tackled after a Nebraska quarterback threw an interception. "It seemed like it was always Rex Burkhead making the tackle in that situation," said Brown, Nebraska's current director of player development and former running backs coach. "You look at his talent and intangibles and you go, 'Why wouldn't you want that guy on your football team?'" said Brown, recalling what he used to tell NFL scouts. The Super Bowl champion New England Patriots apparently feel the same way. Brown shared one of his favorite memories of Burkhead's time at Nebraska, a memory that demonstrates the player's selflessness. It occurred Nov. 25 of 2011 at Memorial Stadium. During the final moments of a 20-7 win against Iowa, Burkhead had 37 carries and needed just one more to set the school single-game record. Bo Pelini, Nebraska's head coach at the time, yelled toward Brown to get Burkhead in the game to set the record. There was a problem. 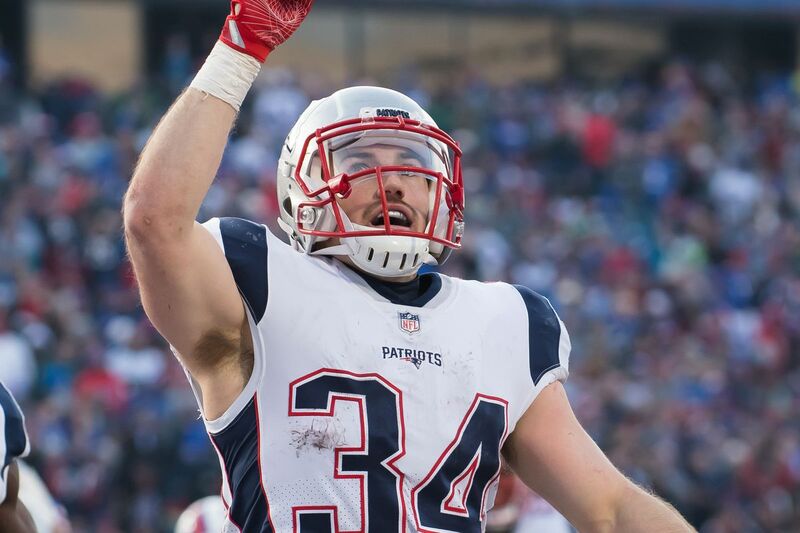 Burkhead didn't want to go back in the game just to set a record. He didn't want it to be about him. "I had to literally tell him, 'If you don't get in the game, bro, you're going to get me fired,'" Brown said with a laugh. "He ran in there, took a knee and got his 38th carry. He didn't want to do it that way. I've always loved his humility." What's more, Burkhead's faith in God and love for his family "overflow in the way he plays," Brown said. "He's one of the most tenacious, intense players you'll ever see, but it's done out of love — not revenge, not hate — it's a love offering," Brown said. "That's what it is." IOWA CITY, Ia. 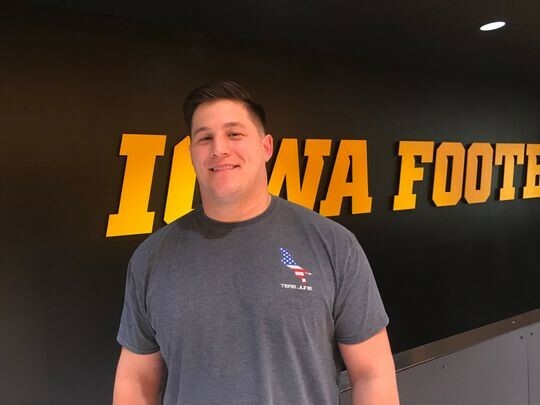 — James Ferentz chuckles when the topic of his working at a carpet store comes up. He says that the often-told, warehouse-to-Super Bowl story is a bit overblown. It’s true, he was doing manual labor at Randy’s Carpets in Coralville to make a few bucks 5½ years ago, with a wedding on the way and his football career seemingly on the fast track to nowhere. But the real essence of the story wasn’t the mundane hoisting of rugs into a truck while waiting for a long-shot NFL chance. It was the decision to keep trying for that chance. 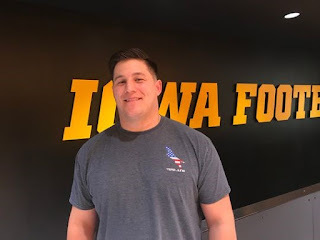 And that stems from a piece of advice his father gave him, after his Iowa playing days ended in 2012 and he went undrafted and unsigned in the NFL. You might have heard of his dad, Kirk Ferentz. 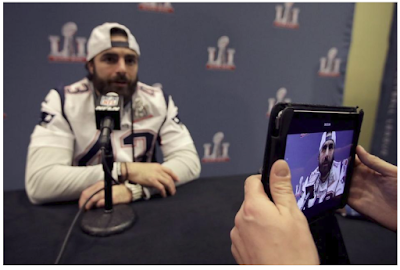 Now that we know how it turned out — that James would not only win one Super Bowl ring with the 2015 Denver Broncos, but a second earlier this month with the New England Patriots — it’s easy to look back and say that was an obvious decision, to keep on chasing the NFL dream. But imagine the real dilemma James was facing. He was already told by the NFL he wasn’t good enough. Why keep at it when there's little chance the phone will ring with an opportunity? The rigors the body goes through to play football at the highest level are a gauntlet, both physically and mentally. Plus, a life with his high school sweetheart was waiting. “Sometimes you need to follow advice blindly. As long as it is coming from a good person — I should probably add that in there,” James says in an endearing way that mimics his father’s self-deprecating humor. “And I trust my dad a lot. He hinted at me, the journey wasn’t quite over. A phone call from Bill O’Brien with the Houston Texans got his foot in the door, and he took advantage of that opportunity to earn an NFL practice-squad spot in 2014. Then Ferentz spent two years with the Broncos, mostly as part of the (more financially lucrative) 53-man roster, as a backup offensive lineman and occasional fullback. The last two years, he’s been learning under arguably the NFL’s greatest coach ever, Bill Belichick, on the Patriots’ practice squad. Ferentz credits the disciplines he learned at Iowa for making him a reliable NFL backup — and right-place, right-time luck to have now won Super Bowls alongside Peyton Manning and Tom Brady. Of course, he’d love to be playing on Sundays. Being on the practice squad isn’t too glamorous. As the job title indicates, you primarily … practice. Yeah, there’s a chance a practice-squad player gets called to suit up and play — as he did for two games last season with the Patriots. But it's rare. And now, under the NFL’s collective-bargaining agreement, Ferentz's practice-squad eligibility (three total years) has expired. To keep his NFL career alive, he'll again need to make a 53-man roster. So, he’s in Iowa City, plugging away. He and wife Skylar live in a starter home on Iowa City's west side with their two young sons — Forest and newborn Lincoln, who arrived at nearly 11 pounds (!) between the AFC Championship Game and Super Bowl. Ferentz says training with hungry, young Hawkeye players keeps him motivated. Listed at 6-foot-2, 300 pounds, he’s happy to report continued weight-room gains. He will turn 30 in June and is under (a non-guaranteed) contract with the Patriots for one more year. They could cut him at any time. One would imagine that coaching will one day be in Ferentz's future — and he doesn't dismiss that, considering his lineage and love for football. He fervently keeps up with the Hawkeyes and remains close with older brother, Brian, Iowa’s offensive coordinator. As we continue our interview inside the Hansen Football Performance Center, Brian pops in to say hello, then heads back into his office. James chuckles at how busy his brother is. He likes playing football and isn't ready for that lifestyle yet. A day of training is in the books, and it's time to hang out with the family. Tomorrow, he'll get back at it again. “I’m always trying to fight to be on a 53-man roster,” James says. 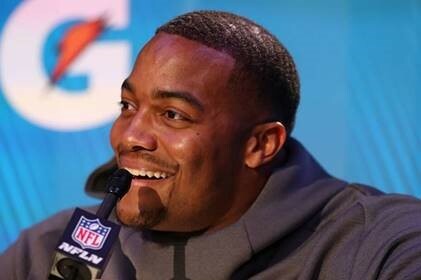 “By no means have I ever been on a practice squad and been like, ‘Wow, I’ve really made it.’ It’s always a disappointment to get cut and told you’re not good enough. But it’s just the reality of the business. 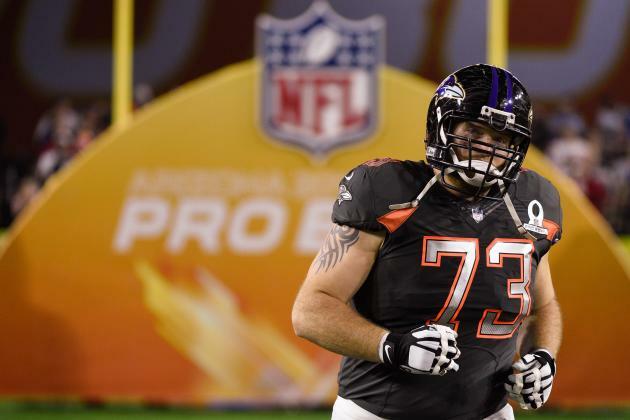 Marshal Yanda earned his seventh Pro Bowl this past season. These are seven consecutive that Marshal has played. 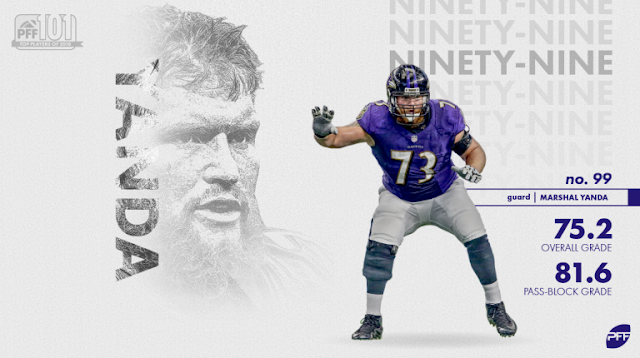 He also earned the Ed Block Courage Award, voted on by his Baltimore Ravens teammates. The Pro Football Hall of Fame currently has 326 members, 286 which are players. There have been more than 26,000 men who have played in the NFL. Only about 1 percent make it all the way to the hall of fame. Three Iowa Hawkeyes have been enshrined into the Pro Football Hall of Fame: Emlen Tunnell, Paul Krause and Andre Tippett. By comparing just the number of Pro Bowls, Marshal has equaled or passed 179 of the 286 players already enshrined into the hall of fame. Here are just 30 hall of famers he has passed so far: Troy Aikman, Marcus Allen, Jerome Bettis, Terry Bradshaw, Earl Campbell, Larry Csonka, Terrell Davis, Eric Dickerson, Mike Ditka, Tony Dorsett, Carl Eller, Dan Fouts, Red Grange, Bob Griese, Charles Haley, Michael Irvin, Charlie Joiner, Jim Kelly, Curtis Martin, Randy Moss, Joe Namath, Ozzie Newsome, Ray Nitschke, Terrell Owens, Ken Stabler, Bart Starr, Roger Staubach, Lynn Swann, Andre Tippett and Doak Walker. Since 1936, there have been 253 Hawkeyes drafted into the NFL. I believe Marshal has already earned the Iowa Hawkeyes NFL Mount Rushmore alongside Tunnell, Krause and Tippett. One of Marshal’s top awards is the Bruce Matthews Award, for the top offensive linemen in the NFL. He should also receive the NFL All-Decade Team for 2010-2019 and someday be inducted into the Baltimore Ravens’ Ring of Honor. Marshal proudly wore the black and gold for the Iowa Hawkeyes. I believe someday he will be wearing gold again, that will be the day Canton, Ohio presents him with a gold jacket for being the first native Iowa Hawkeye to be enshrined into the hall of fame. 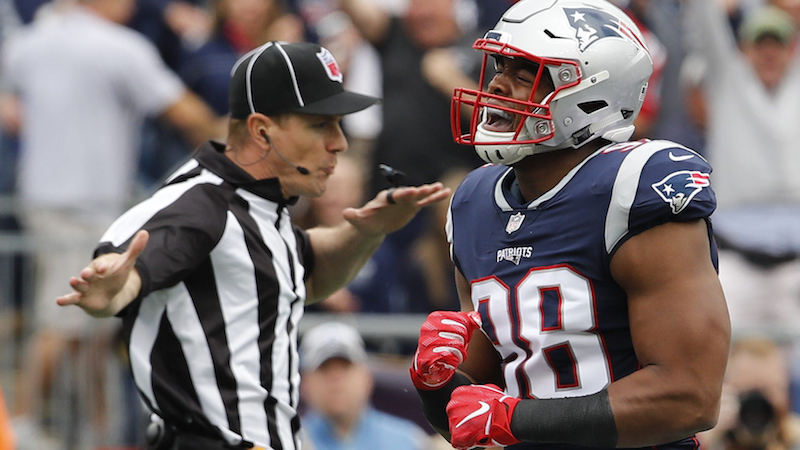 The New England Patriots may have given Tom Brady his sixth Super Bowl ring by defeating the Los Angeles Rams in the big game two weeks ago, but the star of the show was their incredible defense. They held the explosive Los Angeles Rams to only three points in that game, and while just about everyone on defense did their job in the legendary performance, the player that stood out was clearly Trey Flowers. 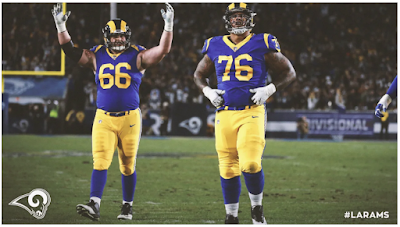 He generated a ton of pressure on Jared Goff while also proving invaluable in run-support to help secure the victory for New England, and on Thursday, he took to Twitter to remind the world of the monster game he and his defense played. This is particularly relevant now, with less than a month to go before free agency begins. 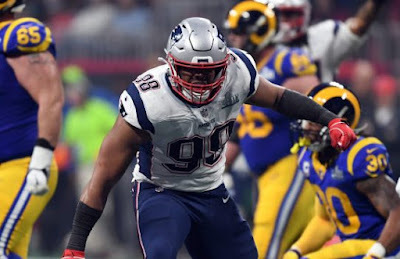 Flowers is going to hit the market if the Patriots don't use their franchise tag on him, and he is going to be worth a fortune. His low sack totals don't tell the story of what he brings to a defense. He is perhaps the most well-rounded 4-3 defensive end in football right now, capable of dominance against both the run and the pass, and his playoff run should have sent his value through the roof. The going rate for top pass-rushers right now is around $15 million per year. According to Spotrac, the highest-paid defensive end in the NFL in terms of average salary is Olivier Vernon at $17 million per year, and he signed his contract three years ago. With an expanding cap and the whole NFL able to bid on him, it wouldn't be inconceivable for Flowers to top that. The Patriots have been hesitant to give out that kind of money in the past. They had Chandler Jones on their roster, but rather than pay him the $16.5 million per year the Arizona Cardinals are paying him, they traded him. New England prefers to pay several players mid-range salaries rather than go whole hog for any one star. That strategy has delivered them six championships, so it would be hard to argue its overall effectiveness. And perhaps Flowers knows that, and is reminding the Patriots with this tweet just how valuable he is. It would not be an exaggeration to say that the Patriots won the Super Bowl on defense alone. The offense produced only 13 points. That doesn't mean the Patriots are weak on that side of the ball, but with Brady entering his age-42 season, New England won't be able to rely on him forever. Their best bet at sustaining this success when he retires might be defense, and Flowers is the best player they have on that side of the ball. Paying him now could save them a lot of headaches later. 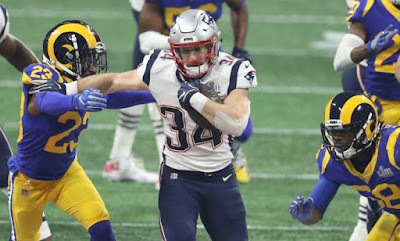 When New England Patriots running back Rex Burkhead touched the football in Super Bowl LIII, good things happened. Plenty of Patriots had a play or two that had a major impact, a play that will live in the minds of fans. Running back Sony Michel scored the game’s only touchdown in the Patriots’ 13-3 win. Rob Gronkowski had the 29-yard reception that put the Patriots on the 2-yard line for Michel’s touchdown. Cornerback Stephon Gilmore had an interception that ended a fourth-quarter Rams’ drive. Defensive end Trey Flowers had a sack that put the Rams out of field goal range. The list goes on. Burkhead didn’t have one of those plays. But his performance was still admirable and, frankly, unheralded. He finished with seven carries for 43 yards (6.1 yards per carry) with a 26-yarder in the Patriots’ final offensive drive, which ended in a field goal that essentially clinched the game. Burkhead also had two receptions for 15 yards. He touched the ball on nine of his 19 snaps. He did that in a game where running back James White, one of the heroes of Super Bowl LI, was surprisingly absent with two carries for four yards and one receptions for five yards. Burkhead did what he had done all year: a little bit of everything. None of his touches went for negative yardage, except for a reception which got wiped away due to an unnecessary roughness penalty that gave New England 15 yards. Burkhead hasn’t become a household name because of injuries and a crowded backfield over the last two years. His contributions tend to fly under the radar. However, he’s provided reliable on all four downs with 18 special teams snaps (67 percent). In an offensive game where everyone but Julian Edelman had an inefficient game, Burkhead was a sneakily productive piece. 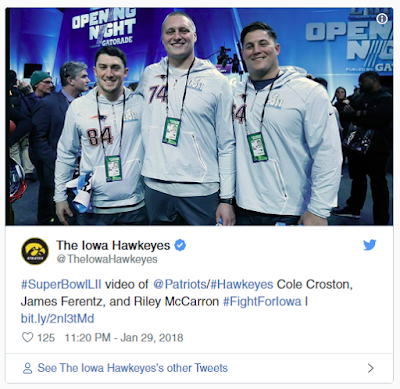 The New England Patriots won the Super Bowl this year (again) and, as Courtney noted yesterday, that meant that four former Hawkeyes got Super Bowl rings: Adrian Clayborn, Riley McCarron, Cole Croston, and James Ferentz. 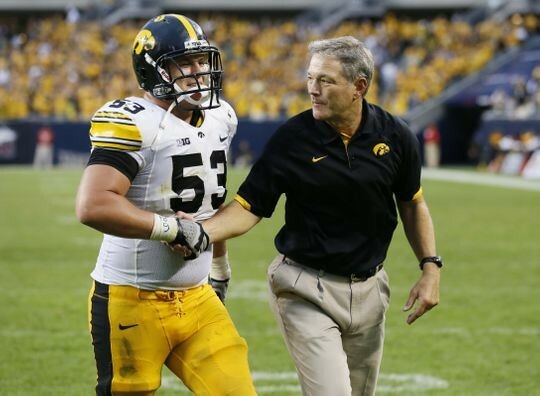 Ferentz was a healthy scratch for the Super Bowl itself, but he still gets a ring. And this wasn't the first time he's been involved in the final game of the season -- far from it. In fact, James Ferentz has been on a team in three of the last four Super Bowls. Not bad, James. Not bad at all. 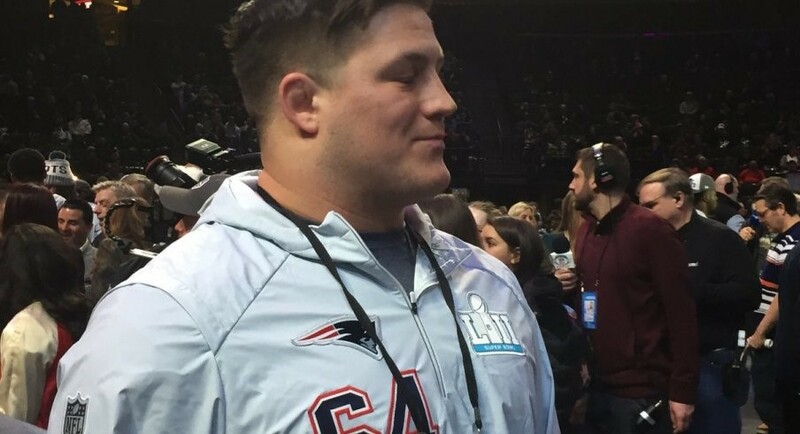 And a lesson to the other 31 NFL teams out there: if you want to make the Super Bowl, consider adding James Ferentz to your roster.